The shift is now towards maximizing output from wells already in production. Injection wells have a dual role to play in helping operators squeeze more from existing assets. Injectors provide pressure support to aging reservoirs as formation pressure falls following years of production. And, in EOR applications, strategically located wells are repurposed as injectors, using engineered fluids to drive hydrocarbon deposits towards producing wells. In both of these instances using a well to deliver fluids to the formation – rather than extract them – brings a unique set of challenges to be overcome. Fluids must be able to be injected uniformly along the target interval. Any barriers to injection encountered can cause an unwanted pressure build-up and risk fracturing the rock, rendering it impossible to place fluids with the precision required. Drilling mud residues from the near wellbore area can also be pushed out into the formation, adversely affecting the injectivity of the well. Given the growing importance of injection wells to future oil production it’s clear that addressing drilling damage with an effective wellbore clean-up strategy is critical to maximizing injectivity. And the key to uniform clean-up treatment lies in the comprehensive removal of this filter cake. The conventional service company approach is to spot acids in the wellbore to break down filter cake. HCl acid-based treatments dissolve any carbonate component that may be present due to fines from the formation, or added at surface as a weighting agent. Yet reservoir drill-in fluids can also include different starches and additives such as cellulose and xanthans – polymeric components that cannot be tackled effectively by off-the-shelf acids. By analyzing the specific chemistry of this filter cake, Cleansorb technicians can accurately recreate a mud cake in the lab that is impervious to flow at the conditions found in a client’s well. These initial qualitative tests enable us to design a treatment based on the particular formulation of drill-in fluid used, a solution that can provide full filter cake dissolution in a single treatment, since every mud company and application can present a different composition. To quantify the effects of the Cleansorb solution operators then conduct coreflood tests to measure the baseline permeability of a rock sample from the reservoir (or a close analogue) at reservoir temperature and pressure. Filter cake is applied, followed by the custom treatment solution. By measuring the permeability regained, operators can confirm the target level required for injection to be achieved in the field. Since this validation work occurs before pumping happens, Cleansorb’s approach increases treatment efficiency while reducing the risk of failure. Cleansorb has been working with a major international operator on a project to enhance recovery from a maturing North Sea field using injector wells. The operator’s aim is to extend the life of this twenty-year-old field for an additional two decades and beyond. The client has confirmed that following treatment they have been able to hit target injection rates in all of their wells, while pumping remained well below the formation fracture pressure. The success of the clean-up has also removed the need to backflow wells before injection, saving valuable time offshore. 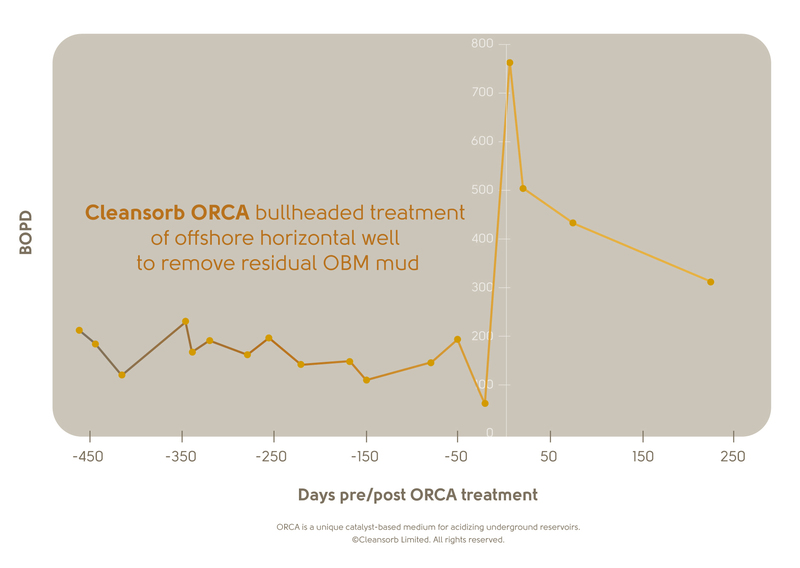 Whether injector wells are introduced as part of recovery strategy, or built into the development programme to maintain pressure from day one, Cleansorb’s uniform clean-up provides operators with an efficient, low-risk way to ensure injectivity levels remain on target.